The demand for welders throughout Ontario and the rest of Canada is high and will continue to increase. 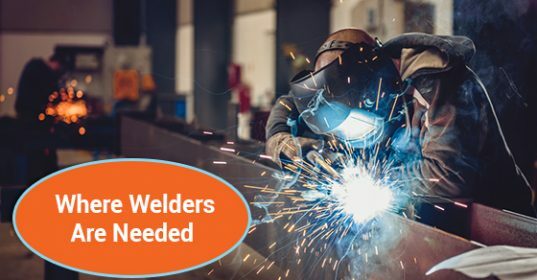 The average age of a welder is 59 – which means that in just a few short years, many welders in the province of Ontario are going to be retiring. To fill in the gap, Canada is going to need to train highly skilled, hard working welders. If you are thinking about a career in welding, below are some of the industries that do, and will, continue to need welders. This is perhaps one of the most respected and intense welding jobs. From welding reactors to underwater welding in pools of radioactive water, the jobs that the nuclear energy industry needs require welders with nerves of steel, incredible precision, knowledge and the ability to work well under stress. The metal fabrication industry builds structures by cutting, bending and, of course, welding metal. Welders are always going to be an extremely essential part of the metal fabrication process for transportation, automotive and a wide range of other industrial sectors. Metal fabrication creates parts for a wide range of industries in the province of Ontario – and without them, the provincial economy and many of its most important industries would cease to operate. As the province of Ontario continues to grow, skilled and competent welders are going to be needed to ensure the success of construction projects, both public and private, throughout the province. One look around cities like Toronto, with it’s never ending commercial and residential construction, should be evidence enough of just how in demand welding is in the construction industry – and it is only going to get bigger. Virtually every single industry that is vital to the economic health of the Province of Ontario, and to the country as a whole, needs welding and welders to stay in business. This is a large part of the reason that there is such a huge drive at the high school and postsecondary level for welders – and an encouragement of young people to pursue careers in welding. If you’re thinking about a career in welding and are wondering about which industries will be in need of your skills, keep the above information in mind.